Your Google Places Landing Page: Homepage or City-Specific? What should you put in the “Website” field of your Google Places page: the URL of your homepage, or of one of your location pages? You know it can affect your rankings. Which one do you pick? I suggest you use your homepage as your landing page, whenever possible. There’s debate over which page to use. This great thread on Linda Buquet’s forum shows that. On the one hand, the homepage URL (AKA root domain) usually has the most page authority – from any links the site has earned. Most of your links probably point there. On the other hand, a location-specific page by definition does a better job of “targeting” (I hate that word) the city you’re in. You’re talking about one city rather than several. From what I’ve seen, the “authority” of the homepage seems to pack more punch for rankings. Why? As I mentioned, my best guess is that it’s because the homepage usually has the most link juice. Or maybe it’s because most businesses’ “location” pages are thin on content or over-optimized – to the point that maybe Google dings them. I don’t know. I also know I’ve had a couple of clients whose rankings were nowhere until we switched the URL – on the Places page and in the citations. That’s not the case now – thank goodness. At least at the moment, you can have your homepage rank organically and serve as your Google Places landing page. 1. You’d find it hard to make the homepage title tag relevant to multiple locations. 2. 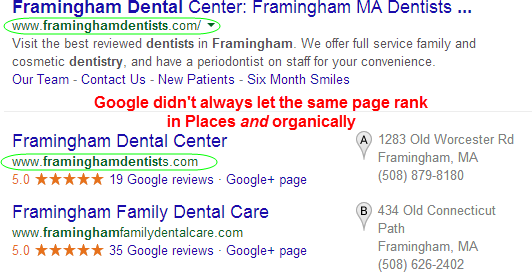 You feel that having the name / address / phone (“NAP”) info for multiple locations on the same page might hurt rankings. For the title tag, just do the best you can – in terms of getting city names in there. In my experience, it’s more important to make sure your main service(s) are in the title tag; Google knows where you’re located. Speaking of Google “knowing” where you’re located, I’ve never seen any bad effects from having multiple blobs of NAP info on the homepage. Please use your discretion. If you’re ranking well already, you should probably leave well enough alone. Don’t go changing your landing page URL everywhere if you’re #3 and want to move up a couple positions. 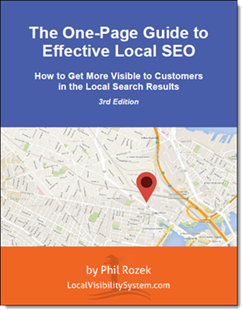 The best situation in which to take my advice is (1) if you’re just starting your local SEO effort, or (2) if you’re not ranking well and you feel like you’ve tried just about everything else. What’s been your experience? Which type of landing page has worked – or not worked – for you so far? Leave a comment! Hey Phil, great post once again, and thanks for linking to my forum post. I posted right after midnight here on the East Coast, but it’s still 5/12 over in your neck of the woods…wonder if that’s it? I’m always torn on this personally. While I have seen location pages compete in some of the most competitive market with their landing pages, I previously didn’t take into consideration the artificial link profiles they had pointing to those pages. In my opinion a location page would provide a better user experience (if done right). On the flip side of course, if you get more visibility by making such a simple change it becomes a no brainer. If you do switch to your home page should you have your NAP on the home page somewhere for all locations as well? Yeah, I’d put all NAPs on the homepage. I just haven’t seen any negative results from doing so. But that’s just my experience, of course. Therefore if trying to abide by Google’s directives, doesn’t it make sense to add the unique URL of a location page to the website field for the corresponding Google+ Local page? Good point, Ben. I’d say the location-specific info should be on the homepage. Interesting post. I’m going to spend some time looking at successful multi location profiles to see what they’re doing on the G+ landing page front. I’ve always been a huge fan of linking to the inner location pages, but that’s based on Google guidelines and what I would want as a user for the best experience. Not exactly great “research” to go by. I’m going to run a test over here on a struggling multi-location company. Yeah, it can be a trade-off. Can you give an example of business that do use a location-specific page for Google places that rank well? We have flower shops, Florerias in DF and Gaudalajara and would prefer to send people directly to the location specific page they want. It can be tough to balance what we prefer with what Google prefers. Great post Phil. I have seen an attorney in the market I work in use his homepage for all his GMB locations pages. To do this, he tweaks the title tag to include all the relevant cities. I think this hurts his organic rankings, but he’s doing well in local. Any thoughts on how to best use the main homepage for all different GMB office pages WITHOUT hurting organic? Thanks. I’d have the NAP of each location on the homepage. I’d probably also have a short paragraph about each office location, and definitely include links to the pages on your site where you talk all about each location. Thanks. You say to put NAP of each location on homepage. Would you use schema for the NAP of each office, or schema only the main office? I wanted to give you some feedback after trying it both ways (homepage on GMB or location specific on GMB). I used the location specific for a few months and got little results. Switched it to homepage, and got into the local pack the same day. Thanks again for all the great info on your site. I was recently reading an article on including UTM parameters in your GMB link. I also noticed the author using a landing page vs homepage. What say you about this? It’s fine to use a subpage as the landing page for your GMB page, but it probably won’t rank well unless you go out of your way to get some good links to that page. That’s why I tend to suggest the homepage; it usually has all the link juice. Dan (the author of that great post) would probably say the same thing. Thanks for your compliments, BTW.